I love my IPSY bag subscription. I look forward to it’s arrival every month. I just hate that it takes till nearly the end of the month to receive it! 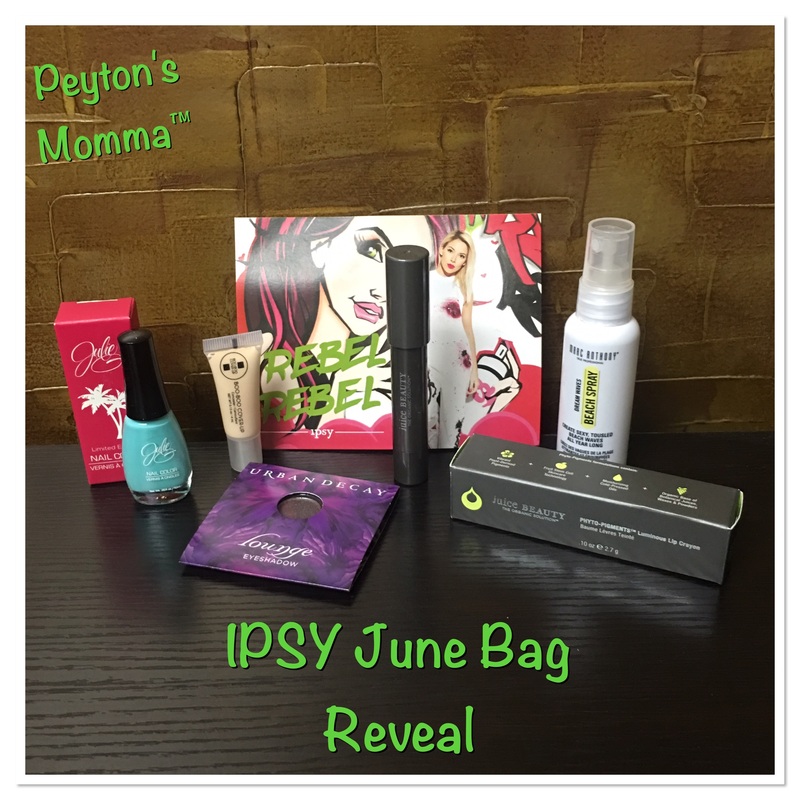 For those of you considering signing up for IPSY here’s what I received this month in my June 2016 IPSY bag – I really like this month’s bag. The graffiti look is fun and colorful. Peyton has already claimed it and I will be reclaiming it after she falls asleep. There were 2 full-size items this month! I’m really excited about the juice BEAUTY lip crayon in Luminous. The lip crayon glides on, leaving you lips saturated with color and a glossy appearance. The second full size was a nail color by Julie G. It’s a shade of blue that I’m exactly crazy about but I know Peyton will love wearing. Next up is a travel size of Marc Anthony’s Dream Waves Beach Spray. This will help you create that tousled beach wave look all year long. Great for us Minnesota girls as we only have access to beaches for a few months each year. Urban Decay even made it into this months IPSY box! I was not happy about how they sent the sample though. It is not compatible with travel or cosmetic bags. And the last beauty item is a sample of Boo-Boo Cover up. Perfect for covering up a blemish or maybe a sun spot. My favorite items out of this months IPSY box was the juice BEAUTY lip crayon. I loved how it’s a full-size product, how it glides on my lips, how I can change the intensity of the color by layering it, the glossy shine and how it moisturizes my lips. Another benefit of being an IPSY subscriber is you have access to special discount codes for the products you received in your bag plus all the other items that were sent out that month. The discounts typically last till the end of the following month. So for June’s bag, the offers expire July 31. For $10 a month you can receive a bag too. Here’s the sign-up. There is a wait list and you’ll most likely be on it for a few months but I think it’s worth the wait.